The name Kai Tak will be familiar to a certain generation. From 1925 until 1998 it was the air gateway to Hong Kong. In the days before the opening of Chek Lap Kok special passengers could be invited to sit on the jump seat of an aircraft as it did a steep right hand turn over the seemingly very close buildings before landing on the single 3,390 runway. Extremely hair raising. At that time cameras were not put in the nose of aircraft in order to watch the landing. Thankfully. What to do with the redundant site posed a question for the Hong Kong government which is now only beginning to be resolved. The redundant airport’s position on the waterfront by Victoria Harbour made for an ideal new cruise terminal. The city state (Chinese Special Administration Region) has come up with not just another infrastructure project but something that could become the centre of a growing and lucrative cruise market in Asia. As ever in Hong Kong, Shanghai and Singapore are seen as competitors but in truth they compliment each other. Whilst the ports in the Gulf are also developing their cruise business Hong Kong says it has far more to offer in terms of market potential. The expansion of the cruise terminal will significantly help the airport and hotel business. Naturally a large shopping mall is part of the complex. The new terminal has been designed by Baron Foster of Thames Bank, also responsible for Chek Lap Kok. It has been a soft opening with Mariner of the Seas, and Diamond Princess due in October followed by Celebrity Millennium for December. It has been planned to take, in time, the largest ships of up to 220,000 tons. The interior, which spans 70 metres, can be converted into a venue for performances, events and exhibitions, supported by the terminal’s restaurants and shops. This flexibility ensures that the building will be used all year round and can fully utilize down time. If you have still not decided on your summer holiday, you have children, and don’t want to spend too much, there is time to book on Norwegian Epic out of Barcelona, an amazing multi-national experience. The ship sails a series of seven-night cruises until early October (when she re-positions to Miami and the Caribbean). Getting to Europe’s largest cruise port from the UK (and elsewhere – from the US too) is very easy with most major airports offering services. The taxi ride from the airport is around €30 and something less than 30 minutes. When you consider the cost of a normal seaside holiday, with all the extras, ships offer extraordinary value. Just one word of advice. Don’t allow the children any credit on the plastic door keys which double as a charge card on cruise ships. A 20-minute visit to the video arcade can quickly become very expensive. Likewise for mobile phones. Make sure they are beyond the children. Our eldest grandson (11) broke up from school a week before his younger brother. Complete with carry-on bag, passport and letter of authority from his parents he joined us at Luton. easyJet is so much better with allocated seats. We were later to learn that there were 4,750 guests (including 1,250 children) on board Epic but within 15 minutes of arriving at portside we were on board and surveying our cabin. Our guest was to sleep on the couch that pulled out to form a bed. Some standard balcony cabins have a fourth berth, a bunk that comes down from the wall. With the large veranda it works well but you have to be tidy and disciplined. The ship operates a screen-based video system called iTV. 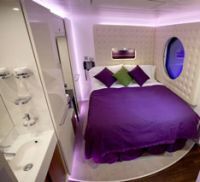 This give you 20 TV channels, dining details and reservations, port and spa bookings, your diary, ship’s information, and a weather forecast (not that we needed this item – the Med was calm and the sun out every day). It detailed your extras bill. Norwegian Epic entered service in June 2010, unashamedly a floating holiday resort very slightly bigger than QM2 (3,020 passenger including children) but far less than RCCL Allure of the Sea with 6,360 berths. To be honest we did worry how we would cope, being for the most part at home on smaller cruise ships. But in truth, except for extremely busy times on the main lower entertainment decks, we lived with the numbers. At all times we were able to find a seat to sit in the sun and with 27 eating places, queuing for the most part was minimal. On this trip, 66 countries were represented (the record stands at 85), with 1,200 from the US, 660 UK and 500 from Norway. The crew are just as mixed. English is the first language with Spanish second, and German. In fact it was a very quiet ship with announcements kept to a minimum. Epic is not perfect, but it is very good. 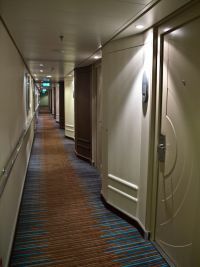 One idea is a concept called ‘Waves’ which is fine in the corridors (see photo) but does not work in the cabin alternating the layout to maximise space with the bed by the window and reversed for next door. For the recently introduced Breakaway and succeeding ships Norwegian has gone back to the traditional concept (See BTN 27 May). For our grandson the trip was a great success. From Barcelona a day was spent at sea, then Naples, Civitavecchia (for Rome), Livorno (Florence), Marseilles and finally Palma. We only left the ship at Rome (complete with moans about the walking) but we could have got off at all the ports of call. We used Cruising Excursions for the Rome tour, an ABTA bonded UK operator who guaranteed to get us back on the ship. They are substantially cheaper than the ship’s packages but at Rome you did need to transfer out of the port via the free shuttle. The quality of the guide was top class. The children’s operation is professionally run and you have to stick to the rules regarding checking in and checking out. The enthusiastic specialist team runs what it calls ‘Splash Academy’ (complimentary) from three to 17-year olds (and help is provided for even smaller ones) divided into age groups. It is open from 09:00-22:30 when at sea (and you can pay for the service into the night) with a proviso for collecting them at meal times. In port feel free to leave them with the excellent staff, but here it does cost €6 per day for mealtime supervision. It means you can go sightseeing and relax without the children who can get grumpy on expensive coach tours. They (and you) can eat as much ice cream as you like courtesy of the ship, and likewise the basic soft drinks. The self-service machines are just by the coffee and hot water dispensers, with every variety of tea available. For our grandson the ship was perfect although he moaned at not being allowed in the massive gym (complete with full-size quash court). He was allowed to roam at leisure and whilst clearly stopping for the odd item of food always turned up at the pre-arranged meal times. Called the Garden Café the well laid out main cafeteria is a great improvement on previous ships with a number of cooking points for egg dishes at breakfast and specialty items at other times. The top decks of Norwegian Epic include an Aqua Park with three full-size water slides and two rock climbing walls. He could visit the bridge viewing room at any time during daylight hours and the sports deck (a full-size tennis court) provided plenty of entertainment to use up energy. The two main swimming pools could have been larger and were very busy. 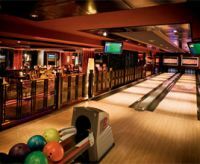 There are six bowling alleys on the ship (2x3) and this is chargeable and very popular on a smooth voyage. Our young one fancied himself at Pool too but got soundly beaten by his grandfather. It is very easy to cover your service charges before leaving on holiday and finish up with a zero extras’ bill. You will have a great time. By the same token one can get through a fortune and attempt to retrieve it in the casino. There is no pressure on you to spend and Norwegian Cruise Lines is very much a ‘hands on’ operation with the Cruise Director and Hotel Manager always seen around, and helping out when things get very busy. When it comes to evening entertainment you are spoilt for choice. 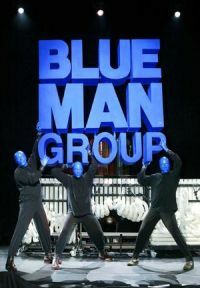 The Blue Man Group was the highlight, followed by Legends in Concert including an excellent Tom Jones and equally good Tina Turner. Our guest very much enjoyed Graffiti Classics, a comedy cabaret string quartet. Karaoke was a must every night for the grandson who is very much into all forms of music. Having paid the supplement (US$30) the Cirque Dreams & Dinner was as good as on Breakaway and we still don’t know how the quick change artists managed 10 different costumes, each one becoming something else in two or three seconds. On this holiday time cruise there was no formal dressing up, but there were plenty of very smart people in the dining venues. Norwegian Cruise Lines pioneered "Freestyle" dining now much copied. In just seven nights it was impossible to try out all that was on offer and we left Cagney’s Steak House, our normal Norwegian favourite alone (US$30 supplement) and opted for the South American Churrascaria (US$20). 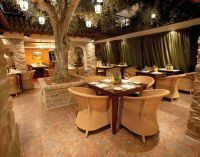 The Manhattan Room is an old-fashioned dinner dance in the stern with same varied menu as Taste, the alternative main restaurant. O’Sheenans (named after the CEO) is pub food and all three are part of the holiday package. Le Cucina is Italian overlooking the bow (US$15), Le Bistro French (US$20) and there are no less than six Asian eateries, some a là carte. For the youngster it was half price unless he wanted the children’s menu, excellent and included. I must mention The Haven, ship within a ship, and private and very much self-contained in three storeys above the bridge. Paying a premium price clients have their own dining room, sun bathing areas, swimming pool, gym, larger suites and concierge service. Children are allowed and often share cabins with their parents. You have the full run of the ship and priority with boarding, shows and dining. The 75 cabins are the first to sell out. At the other extreme is the private Studio area in the bowels of the ship complete with its own lounge. Marketed for singles with tiny but perfectly useable inside cabins offering very good value. Children are not allowed in a large area called Spice H20 in the stern of the ship which includes a small pool and a very large movie screen and amphitheatre style seating. You can even have a quiet breakfast with the same selection as elsewhere and there is a cooking station too. In the evening it becomes a night club under the stars. I started out this piece in an unusual way by saying that Epic was perfect for a family summer holiday. It will probably be just as good for an adult Autumn Mediterranean trip, and perhaps a little less hectic. Or you can spend 11 nights on a leisurely Atlantic crossing to Miami. Maybe even visit the vast on-board Spa. Air Partner: It does not happen very often but it is good to learn that Air Partner, listed on the London Stock Exchange, and one of the world’s largest aviation charter companies, has developed an unprecedented global contingency plan that ensures cruise passengers get home quickly and comfortably in the event of an incident. Worldwide, the cruise industry launches roughly 10,000 annual voyages and is capable of supporting nearly half a million passengers, at any given time. Despite this, the likelihood of a major cruise incident is extremely low, but the Gatwick-based company is still urging the cruise industry to have advanced plans in place for their 20m annual passengers, prior to embarking. Graham Davey, Manager of Air Partner’s Emergency Planning Department, said: “By their very nature, incidents like these never seem to happen during standard working hours. In having a contingency plan in place, cruise lines are prepared for every eventuality if something does go wrong. Preparation makes a huge amount of difference when you are evacuating thousands of people with only a moment’s notice”. Monaco Grand Prix: The Hungarian Formula One Grand Prix may have only taken place yesterday but if you are a motoring racing fan (and enjoy cruising) you really need to plan ahead. And there are not a lot of people who can claim to have sailed into Monte Carlo for the world’s most glamorous high-speed extravaganza aboard a real sailing ship. Next Spring Star Cruises is taking the 170-passenger tall ship Star Flyer into Monaco for the 2014 World Chamionship race. On 25 May, the ship will be anchored off the harbour at Monte Carlo for the day. Passengers board the ship the day before in Cannes. After the race Star Flyer departs on a voyage around Corsica and the French Riveria, calling at L'lle Rousse, St Florent, Figari Beach, Bonifacio, Porto, Scandola Nature Reserve, Porquerolles, Sanary-sur-Mer and St Tropez, returning to Monaco on 31 May, with two nights at the 4-star Hotel Port Palace included. The adventure ends on 2 June transferring from Monaco to Nice airport by helicopter. Cost is from £2,599 per person, including flights from London to Nice, transfers, full board on the cruise, bed and breakfast in the hotel, Grand Prix general admission tickets, helicopter transfer to Nice, Passport to Monaco and port taxes. www.starclippers.co.uk. 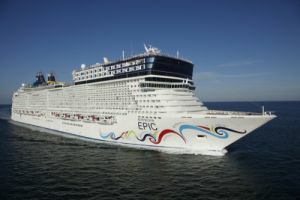 Norwegian Cruise Lines: Following the success of Epic (see above) and the enthusiastic reception given to Breakaway in New York (See BTN 27 May) Norwegian Cruise Lines has contracted for a further two ships in the 150,000 ton, 4000 class making five in total. Already nearing completion is Getaway, due to be completed in January, and based in Miami. The ships will be a similar design to the Breakaway class ships, but slightly larger. The they are set to carry 4,200 passengers and will be the largest in the Norwegian fleet. The first ship is due to debut in October 2015 and the second one Spring 2017.
what it calls “the most luxurious cruise ship in the era of modern cruising”, with delivery scheduled in Summer 2016. It is an all-balcony ship. Crystal Cruises: One of the world’s most luxurious large cruise ships, Crystal Serentity, is to have a US$17m upgrade this November. The line is planning sweeping makeovers of the ship’s Crystal Penthouses (the line’s coveted top accommodations) and Lido Deck, including the popular indoor/outdoor Trident Grill, Tastes restaurant and Crystal Serenity’s Lido café. Building upon the success of Crystal Symphony’s “living wall”, Crystal is expanding its green concept to the Lido area. Maintenance, cleaning, mechanical updates and environmental upgrades will also be implemented throughout the ship’s interior and exterior spaces during the two-week dry dock at the Navantia Shipyard in Cádiz (Spain). Natural stone, wrought iron and an array of blues set the resort-like tone for the space’s major reconfiguration that will remove its indoor pool and Tastes kitchen, move the ice cream bar to the Trident Grill and add more sofa seating, an open kitchen and a cocktail bar. In addition, four ‘living walls’ and additional greenery surrounding the Trident lounge area will bring the outdoors in. As with Crystal Symphony, Crystal Serenity’s Lido café will be redesigned with modern food islands replacing long buffet counters, more tables for two and a fresh baked goods kitchen. A new cherry wood dance floor will also be installed in the Palm Court, the ship’s largest gathering place for drinks and dancing.